Erna Solberg, who arrived on Monday, was accorded a ceremonial reception at the Rashtrapati Bhavan this morning. 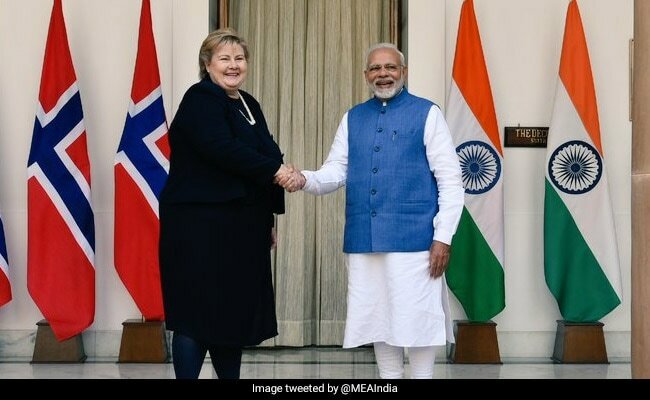 Prime Minister Narendra Modi on Tuesday discussed with his Norwegian counterpart Erna Solberg cooperation in efforts to achieve Sustainable Development Goals and ways to give a new direction to bilateral ties. PM Modi and PM Solberg held delegation-level talks and reviewed the India-Norway ties. "We reviewed all areas of our cooperation, and discussed ways of giving new energy and direction to bilateral ties," PM Modi said in a press statement after talks with PM Solberg. He said they also had "fruitful discussions" on all aspects of ocean economy. India and Norway have strong cooperation at the international level. Both the countries coordinate closely on issues such as UN Security Council reforms, multi-lateral export control regimes and terrorism. PM Solberg, who arrived in Delhi on Monday, was accorded a ceremonial reception at the Rashtrapati Bhavan this morning. The Norwegian prime minister, during her press statement, said cooperation in the fields of energy, climate change and environment was also discussed in the meeting with her Indian counterpart. She said the world will not be able to achieve SDGs if India is not involved. Separately, External Affairs Minister Sushma Swaraj called on Solberg and the two leaders had a good exchange of views on expanding ties across all sectors, officials said.